Clinton’s campaign manager urged her to fire Burns Strider, but he was fined instead. Strider was an adviser during Clinton's 2008 presidential campaign. 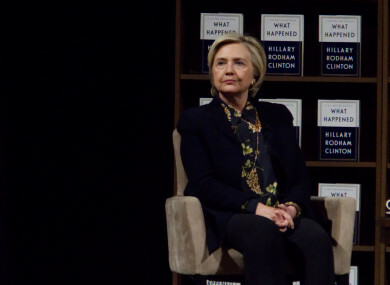 FORMER US PRESIDENTIAL hopeful Hillary Clinton chose to keep a top adviser who’d been accused of sexually harassing a younger colleague repeatedly on her campaign team, the New York Times has reported. Burns Strider was a senior Clinton adviser during her 2008 presidential campaign, and was docked several weeks pay over the alleged harassment. Clinton’s then-campaign manager is said to have urged her to fire Strider, but he kept his job while the woman he allegedly harassed was moved to a new position. In a statement from lawyers for Clinton, it said: “To ensure a safe working environment, the campaign had a process to address complaints of misconduct or harassment. When matters arose, they were reviewed in accordance with these policies, and appropriate action was taken… This complaint was no exception. The complaint against Strider was made by a woman who shared an office with him. She told an official on Clinton’s campaign that he had rubbed her shoulders inappropriately, kisser her on the forehead and sent a string of suggestive emails. Clinton’s campaign manager Patti Solis Doyle was involved in discussions with other senior officials about the allegations. It was said that some were troubled that Strider was allowed to remain on the campaign. Doyle is said to approached Clinton and said she should sack Strider, who was married at the time. Clinton chose otherwise. The woman in question has not spoken publicly about the alleged incidents, as most staffers on the campaign would have signed non-disclosure agreements. Those who came forward to the New York Times said they did so on the back of the recent #MeToo movement, which has seen women speak about sexual harassment they’ve experienced across a wide variety of industries. Email “Hillary Clinton kept top adviser accused of sexual harassment on her campaign team, reports say”. Feedback on “Hillary Clinton kept top adviser accused of sexual harassment on her campaign team, reports say”.